I spent some time today attempting to explain my fascination with the British royal family. Mostly it's just inexplicable (why does anyone have any interest in any celebrities at all?) but a large part of it is just having a little glimpse into a lifestyle that is so very different from my own, in pretty much every way possible. I'm just a little older than The Duke Formerly Known As Prince William (does that have some kind of fancy pictograph?) and so I've spent my life sort of watching him grow up, and, through him, having a window into what life is like for the .000000001%. And Kate being a commoner added another dimension to that -- so many people (including, according to at least one account I've read, Kate herself) grow up with that "I'm gonna meet a PRINCE" fantasy -- but how often do we get to see it actually play out? I find the whole thing a fun exercise in "what if." As the OMG ROYAL BABY! excitement grew to fever pitch this week, I found myself wondering whether Kate has been able to really process the whole thing yet. Obviously, she knew what she was getting into by marrying William and has had years to think about these things, but when I think back to my own pregnancy, I remember how hard it was to wrap my mind around the fact that I was creating a whole entire human being. Heck, three years on, sometimes the whole thing still just seems surreal. 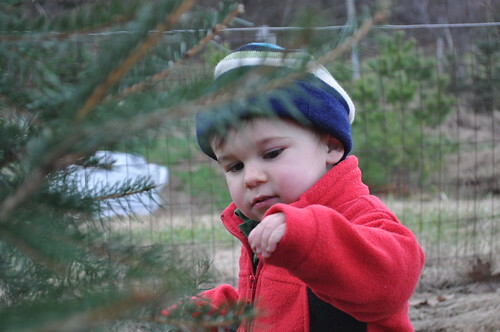 And while of course I think my son is marvelous and amazing and wonderful (because he is)...he's just a kid. A normal, regular, common, everyday kid. He'll only make it into the history books through his own actions and accomplishments. I can't help but think that it must feel extremely strange, especially for a commoner, to know that your child is ensured a place in history just by virtue of having been born. How odd, to birth a future king. When Ian was just a couple of days old and I was in the throes of those horrible postpartum mood swings, I was sitting on the couch with him on my lap, telling him how he could be anything he wanted to be. Just talking about it, thinking about it, was enough to make me break down sobbing (but then, so did having to throw out the flowers we'd gotten in the hospital. I'm telling you, I was a WRECK for those first few weeks). But I guess I was wrong, though -- I should have told him that he can be anything he wants to be except the King of England. Funny how this new baby, born to every privilege with the eyes of the world upon him, can ONLY be the King of England. 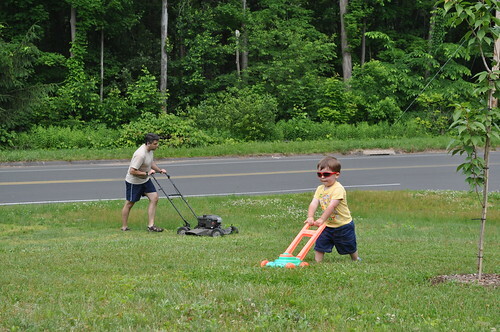 He has wealth, but my son has a wealth of possibilities. And I'll take that any day of the week. Like I said -- fascinating to watch, fun to contemplate. But I'll keep my boring private life. 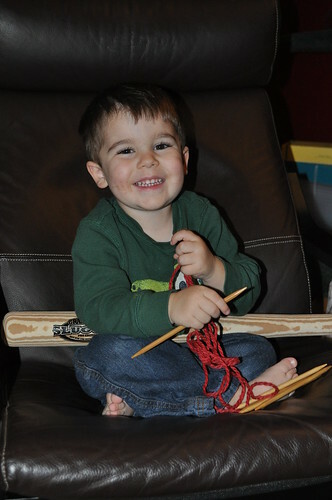 Probably needless to say, Ian has been around knitting since the very beginning. When he was tiny, I perfected the art of knitting while he slept in my arms (and sometimes even while he was nursing, if I was situated correctly). I think that because it's been a part of his environment for, literally, his entire life, he doesn't pay much attention to it -- it's not a novelty (unlike, say, my spinning wheel) so he pays about as much attention to me knitting as he does to me doing dishes. Until now, that is. These days, Ian really enjoys making projects, and he's starting to understand where things come from. He knows that his grandma House made him his favorite dino quilt and that Mommy made him one of his knitted blankets and his beloved hat. It seems that all of a sudden, he started to put two and two together and connected the act of knitting with the finished product at the end. A couple of weeks ago he abandoned his toys and climbed up to sit with me while I was knitting one night; he held my ball of yarn and unraveled it when I told him I needed more. I thought his attention would wander after a couple of minutes, but he sat there with me for probably a half hour, unwinding yarn and asking me lots of questions in that inimitable toddler way. And that's always the first step, right -- watching someone do something, and deciding that you find it interesting? 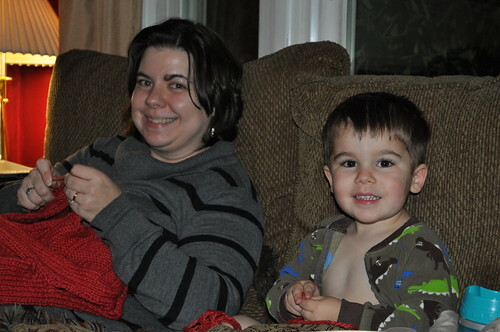 A couple of nights later, he picked up the needles I'd just finished using and told me that HE wanted to knit. So I gave him a little ball of scrap yarn, and he had a blast fiddling with it. And now, it would appear that I've created a monster. Every night, he grabs his needles and little ball of yarn and sits next to me. Two nights ago, I was counting to myself as I picked up a bunch of stitches for a buttonband, and I suddently realized that he was muttering numbers to himself under his breath as he wrapped his yarn around the needle; guess that's what I sound like while I'm knitting! And then, last night we had dinner at House's house, and when we came back home, Ian took off his hat and coat and put them on the coat tree, ran over to the couch, climbed up, and patted the seat next to him. "C'mon, Mommy," he said. "Come sit here. Let's KNIT!" 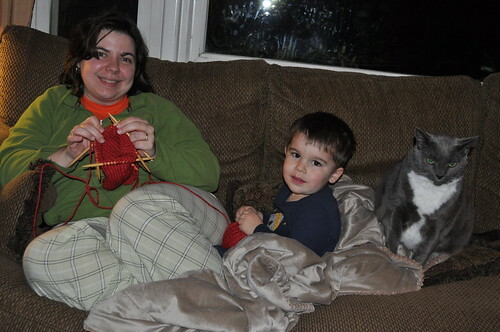 So I got my project, and I snuggled up with my boy on the couch, one of us knitting, one of us "knitting," watching the Rockefeller Center tree lighting on TV. And I'm not going to lie -- Mommy got a little bit teary. How'd I get so lucky? So, what do you think....when will he start actually knitting? 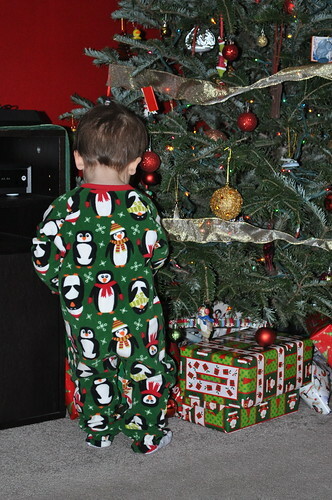 Will he still be little enough to get away with sitting around in unzipped footie jammies with his belly hanging out? One day last week, I took advantage of being home without Ian and I packed away some of his baby toys that he'd really outgrown. He still played with them, but it was becoming increasingly clear that it was just because they were there, not because he was actively choosing them, you know? Packing away the outgrown things is such a bittersweet chore. 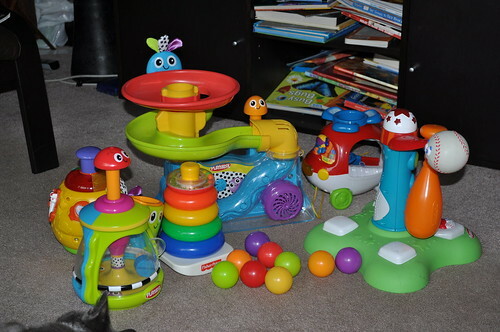 Part of me is THRILLED to get these plastic things out of the living room -- they're huge and they don't store well in any sort of toybox configuration -- but, at the same time, there's something so final about saying goodbye to toys that he loved so much when he was tiny. It's the passing of an era. The toys are just the smallest part of it. There are all the outgrown clothes -- I have to consider and smile at each little onesie and tiny pair of shorts before packing it away into the bin. 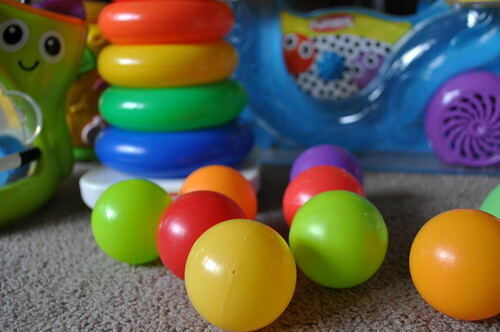 We've long since said goodbye to the bouncy seat and the exersaucer. The highchair hasn't been used in months (though it's still in the corner of the kitchen; we've not yet gotten around to moving it into storage). We can even see the end of Ian's crib days. Bittersweet really is the only word for it. I LOVE the little boy that Ian is becoming. I love that he's so self-sufficient now. I love that he can carry on a conversation. I love that he's starting to really learn his letters and even recognizes his name when he sees it written out. I love how hilariously imaginative he is. I love that we're approaching the age where we can really do things together, like cook and take hikes and stargaze and build birdfeeders at Home Depot on Saturday morning. But at the same time, I loved all the earlier phases too, and it's kind of sad to know that once they're gone, they're gone. Everything is so fleeting -- one day he's calling things "soam" and "happy-to-you," and the very next day those same two objects are the far more pedestrian "phone" and "cupcake" and some of that childhood cuteness is gone. Blink and you miss it. On a practical note, I really wish I knew, long-term, what will happen to all of these things. Many of Ian's little friends have new little baby brothers or sisters at home, or will soon, but we are nowhere near that yet. Honestly, I feel more and more like I might very well be done at one...but who knows how I'll feel two years from now, or five years from now. In the meantime, though, that leaves the question of what to do with all of this stuff. For now, it's just going into the basement because we really would not want to have to re-acquire all of this stuff should we have a second baby, but it would be so much easier to just be able to get it out of the house now. Because if I have such a hard time packing it up now, I imagine it will only be worse in five years when I need to go through it all AGAIN. And then, of course, there's the question of what I would want to keep around -- for nostalgia, for babies who might visit, for Ian to rediscover and reminisce about someday, or just because today's toys are tomorrow's vintage treasures. I can't even think, yet, about how I will make those sorts of decisions. Who ever thought I'd become this much of a sap? Motherhood is indeed a strange journey. 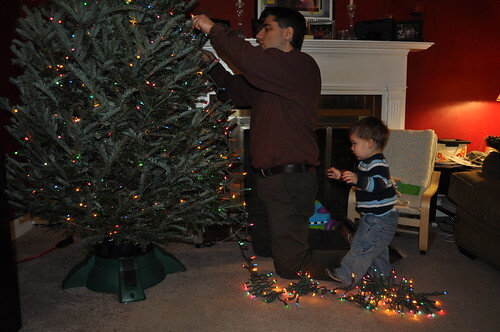 There are a lot of reasons why I'm glad we waited till we'd been married for a decade before moving ahead with Project Child, but one of them is that we had a number of holiday seasons in which to create our own holiday traditions without having to work a kid into them, too. By the time Ian rolled around, we had things pretty sorted out -- you all know it can be hard to create new traditions while still upholding the old ones that you both bring to a relationship -- and, having had a long time to think about what is important to us, we had some pretty good ideas about how we want to share that with our son. We aren't religious by any definition, but that doesn't mean that it's not an important and sacred, if you'll forgive my use of the word, time of year for us. We are lucky enough to have wonderful families that we love and are close to (and actually legitimately like, rather than just tolerate!) and if that's not worth celebrating, I don't know what is. Giving and sharing and caring, and lighting the darkest nights of the year -- all things that are a wonderful basis for a holiday. I've been going to the Wadsworth Atheneum for the annual Festival of Trees for years now, and last year I took Ian with me on a day off. This year, Jim came along too. I think the three of us were the only people there under the age of 50 on the Friday morning that we went, and so Ian was very busy amusing groups of little old ladies with his (well-behaved) antics. We also went to the Christmas House in Torrington, which I cannot adequately explain for you other than to say that it is amazing that the place hasn't burned down, what with all the fire code violations. It's awesome. We didn't go see Santa -- Ian isn't old enough to care, and he HATES standing in line -- but he can now identify Santa on sight ("Tanta!") and will tell you that he says "ho, ho, ho" while rubbing his own little bowl full of jelly. Most important of all, though, is spending time with our loved ones. And this year we get to do it an extra lot -- we always celebrate Christmas in January with my family, so we still have that to look forward to -- but this year Jim's siblings and their spouses, sadly, couldn't overlap their visits home. So we had our usual Christmas Eve with Jim's mom, grandma, sister, and her husband, and then Christmas Day with the three of us plus Mom and Grandma. 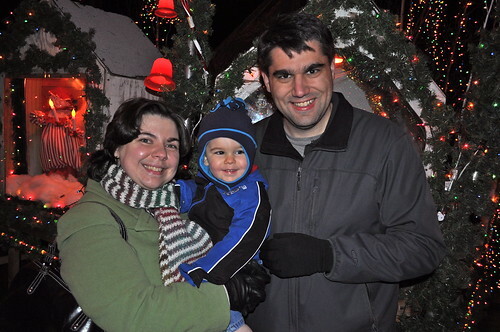 Tonight we're doing Christmas Eve, redux, but with Jim's brother and his wife in place of his sister and her husband. 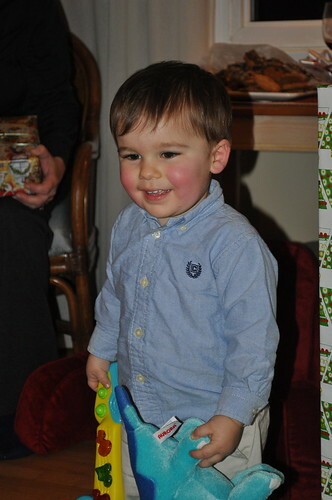 Ian LOVES all the attention, and once he figured out what the deal was with presents, he loved THAT, too. Christmas morning at our house was nice and low-key. Jim and I exchanged our gifts, and tried to get Ian to open some of his. 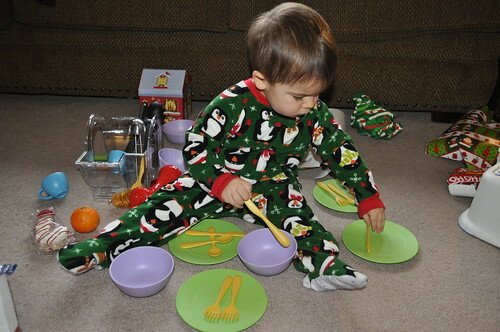 He liked his very first present from Santa -- some play dishes -- so much, that all he wanted to do was play with them. 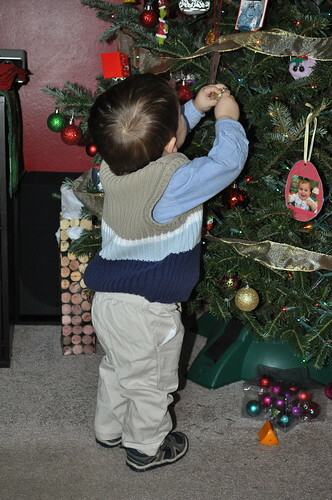 :-) It took us most of the day to get through his gifts, one at a time as his interest dictated. I can't say I minded it -- I know it'll only be a couple of years before he's in full-on Must Open All The Things As Quickly As Possible mode, and for now, it was nice to be able to spread it all out and see the excitement on his face as he opened each thing. Everything elicited an "ooh!" or a "whoa! ", and what really made my little nerdy librarian heart happy was when he opened up his very own copy of Gossie and Gertie -- he loves that book so much, he's worn the library copy right out -- and yelled out "Gossie!" My boy can identify books! And gets excited about them! O happy day! I sincerely hope that you all had a Christmas that was every ounce as happy and fun as ours was. And now, I can start to unveil the Christmas projects -- although even some of that will have to wait till the end of January, after we see my family!! We've been working on weaning Ian from the bottle and transitioning him to cups. Well, "working on" is probably overstating it...what we've done, pretty much, is just stop giving him bottles during the day. We thought that he might be unhappy with that, but we should have known that he would have just gone ahead without an issue. He's been like that since birth. We worried about introducing the bottle - it was fine. We worried about introducing formula - it was fine. We worried about taking him off formula and going to straight cow's milk - it was fine. He is the most adaptable baby ever. 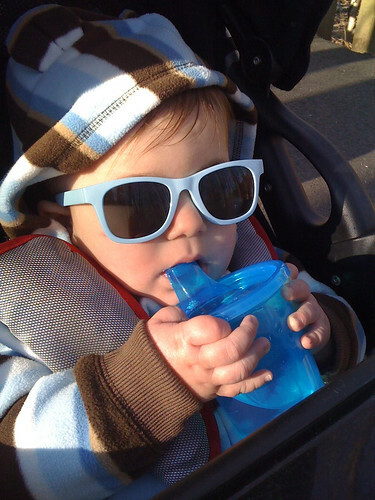 So he's all set with sippy cups. Next step: learning how to use straws. He still gets one bottle a day, as part of his bedtime routine. And I will be honest with you -- I'm sure HE would be fine with giving it up. But poor Mama here does not feel ready for that! Parenthood has made me sappy (sappier, some might argue) and I'm finding that I'm having a little bit* of difficulty letting go of the last vestiges of babyhood, even though I'm very excited to have a KID in the house now rather than a helpless little infant. 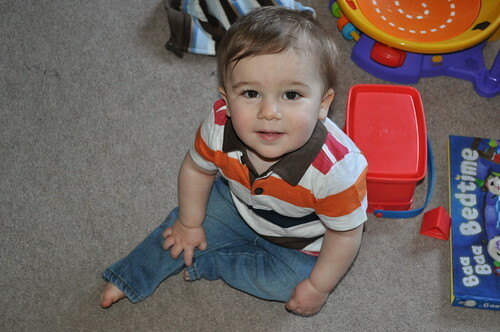 And we won't get into how emotional I get every time I have to pack away clothes he's outgrown. *This may be understating it a little. 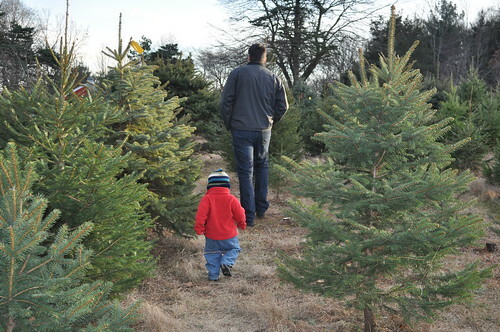 A year ago yesterday, I blogged for the first time about our new little son. It's difficult to believe that this tiny little crying thing is now this handsome little BOY. What a year it has been! I absolutely cannot imagine my life now without my sweet little Ian in it. 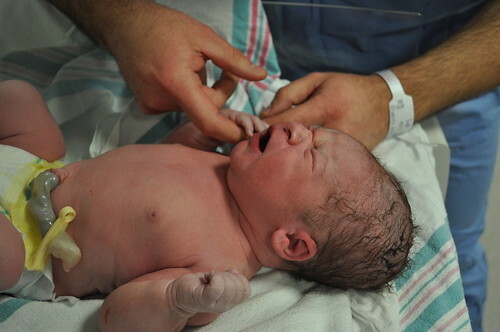 I have many, many things I want to say about my little boy to mark his entry into the second year of life. Those words will come...but for now, I just share these two pictures, and marvel at how far we have come in the last year.